Description: Is Apple's Garageband app too unwieldy, does it overwhelm your kindergartner? (It's OK, sometimes it overwhelms me?) Are they bored with Toca Band and its limited set of interlocking sounds? Does Toc and roll offer some -- but not enough -- flexibility, or does it also feel too much like project management, Garageband on training wheels? Then perhaps Keezy is for your kid (or you). It's actually for both of you, for different reasons. The basic organizing concept is that of "boards," an iOS screen split into eight differently colored squares, each of which has a different sound. Those sounds could be beats, vocal loops, synthesized notes, or your toddler banging pots and pans in the kitchen. Touch a square, and it produces a sound; touch them in sequence, Simon-style, and all of a sudden you've got yourself a song. Or something. How do you get boards for your use? Two ways -- 1) record your own sounds, or 2) use pre-loaded boards from the likes of Reggie Watts, Tegan and Sara, and others. So, basically, you can be as DIY as you want (or don't). But for a toy with a deceptively simple interface and a large range of possibilities (some I'm sure beyond what the creators intended), this is an app worth your download. Posted in Interactive, iPad, iPhone, iPod touch, Music and tagged with Elepath, making music, drum machines, Music, Reggie Watts, drum loops. Description: I'm a big fan of Apple's Garageband app as a kid-friendly musical app -- tapping on the drum set or other "instruments" can produce a surprisingly interactive effect for something that is, well, tapping on a glass screen. But it can be an incredibly complex experience, and if a kid were trying to put together an actual song, the sheer number of choices would probably him or her. That's where Toc and Roll comes in. Simply put, this is the app kids graduate to after getting bored with Toca Band but before they're ready to really create music in Garageband. The app was developed by the much-beloved Barcelona-based minimusica, and it allows you the user to put together tracks designed to fit together harmonically. There are 10 types of tracks -- piano, glockenspiel, guitar, voice (you can record those tracks), violin, drums, saxophone, trumpet, bass, and percussion -- and each of those tracks has well more than a dozen different modular units that are probably a couple measures long. The user can tweak each instrument by changing the volume and providing effects (vocoder, delay, and reverb) and changing the overall tone of the song by changing the tempo. But those are pretty insignificant complaints. For kids with a musical bent, this is a playground well worth your money and their time. Posted in Interactive, iPad, iPhone, iPod touch, Music, Play Along and tagged with minimusica, making music, Music, Garageband, iOS, iPad, iPhone, iPod touch. June 3, 2014 by Stefan Shepherd. Description: If this were 5 years ago, we could call this "Baby's First Rock Band" or "Baby's First Tap Tap [Whatever]" and lots of people would recognize the reference to the games that gave players points for tapping correct "notes" in time with the song. This app is one of the many Seussian apps from Oceanhouse but doesn't really use the famous Seuss words or drawings (the songs are totally made up to Seuss' book titles). The user gets to customize wonderfully goofy instruments (think trumpets with all sorts of crazy bagpipe-like attachments) and, once set, taps notes that correlate to a C major scale in time with the lighted pulses coming down from the top of the screen. You can change the difficulty level -- the harder the difficulty, the more notes you need to tap. You can select a number of different songs, but some instruments and some songs are locked -- you need to achieve a high-enough score to unlock them (or you can just be lazy and pay via an in-app purchase). While the app offers free play, we've never bothered to try it -- aside from the goofy sound and bright colors, there's no advantage to this over, say, Garageband (which we also have installed). Also, until I was prepping this review I hadn't realized that you could also play this on an iPhone or iPod touch. I have no idea why you'd ever want to do that on such a (comparatively) tiny screen. Posted in Interactive, iPad, iPhone, iPod touch, Music, Play Along and tagged with iOS, iPad, iPod touch, iPhone, Oceanhouse Media, Dr. Seuss, Play Along, making music, Music. May 13, 2014 by Stefan Shepherd. In addition, the songs are accompanied by illustrations that feature lyrics to those songs. 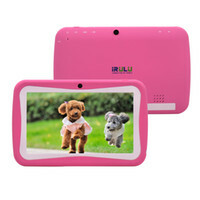 The result is a musical picture book over which the user has some small control. Along with the song, which is one my favorites of Loeb's, I also enjoyed the retro illustrations of Brad Renner; his pancake looks very happy as he goes on his adventures in Loeb's story song, which is kind of the point, isn't it? The price for the app, $0.99, is pretty cheap, the same price as if you'd buy it through the main Mibblio app if in fact you could do so -- which you can't at the moment (or at least I couldn't find it in my app). [Ed. : The folks at Mibblio say it's now available in the main app, too.] As with the rest of the Mibblio apps, it's well-done, and this is definitely one of the more appealing songs in the Mibblio library. Fans of Loeb or the song will enjoy it, and it would make a fine selection if you want to explore the concept for the first time. Posted in Interactive, iPad, Play Along, Music, Read Along and tagged with Lisa Loeb, food, Brad Renner, pancakes, iOS, iPad, Music, interactive, making music, Mibblio. April 29, 2014 by Stefan Shepherd. 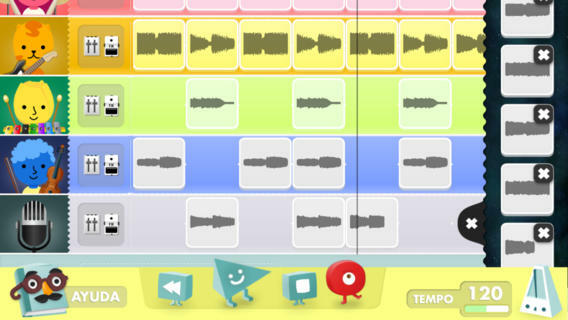 Posted in Interactive, iPad, iPhone, iPod touch, Music, Play Along and tagged with Lullatone, iOS, looping, making music, Music. April 9, 2014 by Stefan Shepherd. In addition, the songs are accompanied by illustrations that feature lyrics to those songs. The result is a musical picture book over which the user has some small control. Since Wilde is a trained illustrator of his own books, album art, and videos, naturally his illustrations (based on the video) are present here as well. Wilde does a good job of conveying personality to the variety of animals with a minimum of adornment. The price for the app, $0.99, is pretty cheap, the same prices as if you'd buy it through the main Mibblio app. It's well-done, of course, and if you have ever wanted to try a Mibblio app (or if you're a KWMC fan), this is certainly a worthwhile one to try. Limited-time note: The song (not the app) is available for a limited time here. Note: I was provided a copy of this app (via the main Mibblio app) for possible review. Posted in iPad, Play Along, Read Along, Music and tagged with Key Wilde & Mr. Clarke, Mibblio, Play Along, iOS, iPad, sing-along. March 26, 2014 by Stefan Shepherd. In addition, the songs are accompanied by illustrations that feature lyrics to those songs. The result is a musical picture book over which the user has some small control. In the case of this app, the illustrator is Aldo Saaf AKA Donald Saaf, who's illustrated a number of Zanes' albums and books. Maybe it's just because I've so long associated Saaf's illustrations with Zanes' music, but I can't picture anyone else doing the illustrations for this. If you're familiar at all with Zanes' music, the illustrations will feel very familiar. Posted in iPad, Music, Play Along, Read Along and tagged with Dan Zanes, Donald Saaf, Mibblio, sing-along, read-along, Music. February 12, 2014 by Stefan Shepherd. Description: I have a lot of "crazy animated figures make music" apps on my iOS devices -- it's the occupational hazard of reviewing music-related iOS apps. One of the funkiest in both sound and design is Jumping Pages' "House Band," a spinoff from their The House That Went on Strike app. Much like Toca Band, you get the option of selecting various non-traditional "instruments" set to play loops that all fit with one another. Unlike Toca Band, these loops were designed by Vernon Reid (whom parents of a certain age may remember from his band Living Colour). They're funky, eclectic, and not necessarily related to the "instrument" selected (the bespectacled iron is a simple bass line). These are loops that parents would enjoy every bit as much as the kids. In summary, I liked the sounds that Jumping Pages produced, probably more than any similar app -- I just wish it was easier to share those sounds with others. Note: I was given a copy of the app for possible review. Posted in iPad, Music, Play Along and tagged with making music, Music, iOS, Jumping Pages, instruments, bespectacled irons, Vernon Reid, Living Colour, Toca Boca, iPad. January 15, 2014 by Stefan Shepherd.